There are two main comparable sources of the energy to the deep ocean : winds and tides. However, the most efficient mechanism that transfers wind energy to the deep ocean is still debated. We have recently demonstrated, using oceanic General Circulation Model (GCM) simulations and analytic derivations, that the wind directly supply energy down to the bottom of the ocean when the wind velocity is stochastic and temporally correlated or when it is periodic with a frequency that matches the Coriolis frequency. Basically, under such, commonly observed, conditions one of the wind components resonates with the Coriolis frequency. Here we have performed a series of rotating tank experiments to study the effect of this predicted resonance and to model the corresponding energy and momentum transfer to deep-water circulation. The lab experiments include a rigid-lid which is librated periodically and stochastically in the rotating frame, exerting stress on the top of the water surface, thus mimicking the effect of the wind stress. We examine different rotation rates and, different stratification profiles. 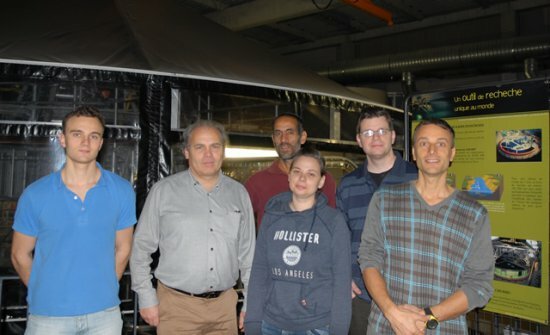 The results of these lab experiments will be used to verify the theory and GCM results of the wind-resonance and its relevance to the large scale ocean circulation.